Despite the growing concern about actual on-going climate change, there is little consensus on the scale and timing of actions needed to stabilise the concentrations of greenhouse gases. Many countries are unwilling to implement mitigation strategies, at least in the short term, and no agreement on an ambitious global stabilisation target has yet been reached. It is thus likely that international climate policies will be characterized by a high degree of uncertainty over the stringency of the climate objective, and that some countries might delay their participation to global action. What additional economic costs will this delay in the adoption of mitigation measures imply? What would the optimal short-term strategy be given the uncertainty surrounding the climate policy to come? Is there a hedging strategy that decision makers can adopt to cope with delayed action and uncertain targets? 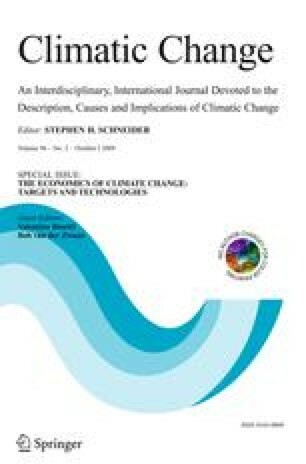 This paper addresses these questions by quantifying the economic implications of delaying mitigation action, and by computing the optimal abatement strategy in the presence of uncertainty about a global stabilisation target (which will be agreed upon in future climate negotiations). Results point to short-term inaction as the key determinant for the economic costs of ambitious climate policies. They also indicate that there is an effective hedging strategy that could minimise the cost of climate policy uncertainty over the global stabilisation target: a short-term moderate climate policy would be a good strategy to reduce the costs of delayed action and to cope with uncertainty about the outcome of future climate negotiations. By contrast, failing to curb emissions in the short term imposes rapidly increasing additional costs of compliance. This paper is part of the research work being carried out by the Climate Change Modelling and Policy Research Programme of the Fondazione Eni Enrico Mattei and by the Climate Impacts and Policy Division of the EuroMediterranean Center on Climate Change. Financial support from the Italian Ministry of the Environment is acknowledged. The financial support of the EC 6FP TranSust.Scan project—Scanning Policy Scenarios for the Transition to Sustainable Economic Structures—is gratefully acknowledged. The authors are grateful for useful comments from participants to the Conference on the “Economics of Climate Change and Sustainable Development”, Chia, Italy, September 2007. The usual disclaimer applies.